Anna University NOV / DEC 2015 - JAN 2016 Results Expected within a week. If AU Published separate results for UG & PG, then the UG Results may expected with in a week (Within February) or March First Week. IF AU Planned to published UG & PG both result at a same time, then the results may be available in March 2nd Week. Because of the unexpected Heavy rains in many districts, this Year Nov/Dec 2015 Exams are extended upto End of January 2016. After a long journey the exams are almost coming to the end. 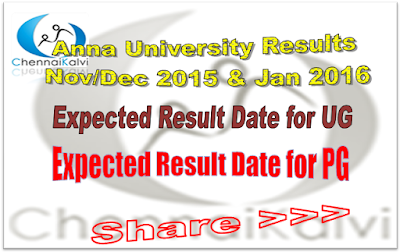 And as per Anna University's Official Reopening Dates, the colleges are reopen on or before 30.01.2016. 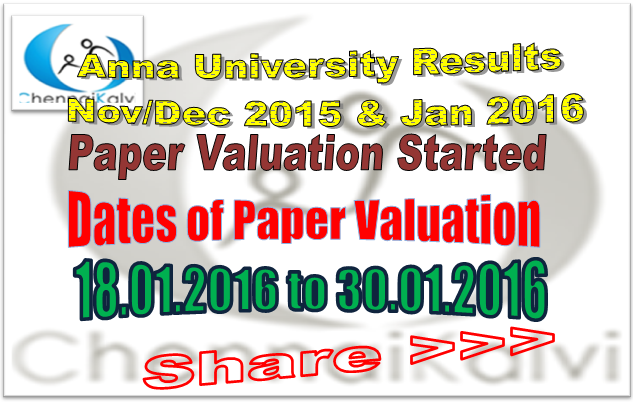 So, the Paper Valuation for all years are started on 18.01.2016. And the Last Date for the Central Valuation is fixed as 30.01.2016. After Paper Valuation The Exam Results may be available at the end of February 2016 or First Week of March 2016.